Matcha, a Japanese powdered green tea, is the star of this recipe. Look how green it is! 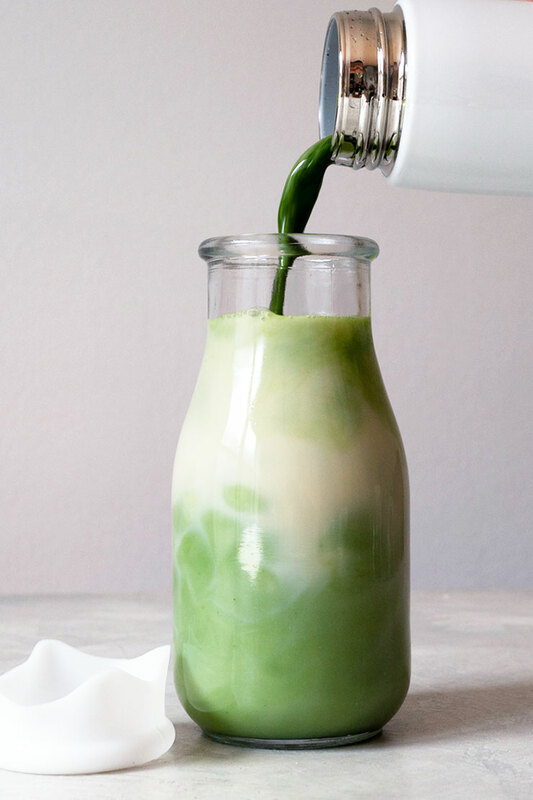 Matcha milk is basically matcha with milk. That’s it. BUT, I’ve made mine oh-so-delicious by adding in some other key ingredients like vanilla extract, maple syrup, and a pinch of salt. It takes me literally 20 seconds to make this drink and you’ll be surprised at how easy this drink comes together. 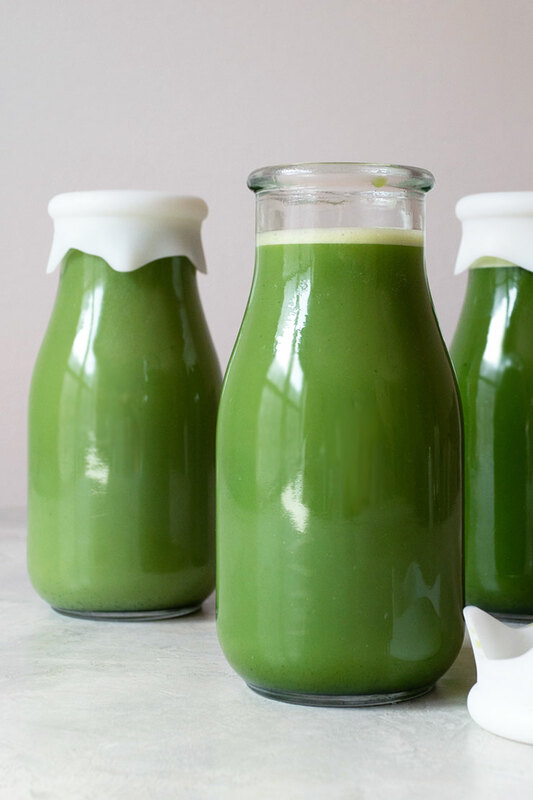 Did I plan for this matcha milk recipe to be vegan? Nope. It was a happy accident. Everything from the matcha to the milk to the maple syrup are all plant based and don’t contain any dairy or eggs, making this drink vegan. I drink coffee in the morning but the rest of the day, I’m drinking tea. Early afternoon when I start to look for an energy boost, I like to drink matcha to wake me up. Studies have found that matcha has a lot of health benefits. Has a lot of antioxidants, which are believed to help fight cancer. Thanks to L-Theanine (an amino acid) in matcha, you may be in a state of relaxation and it can calm your mind. Because of the L-Theanine, you don’t get jittery like you would with coffee. It’s an energy boost that can last up to 6 hours. Matcha is packed with potassium, calcium, iron, and vitamin A and C.
Matcha is rich in fiber. Is There Caffeine in Matcha Milk? Yes! 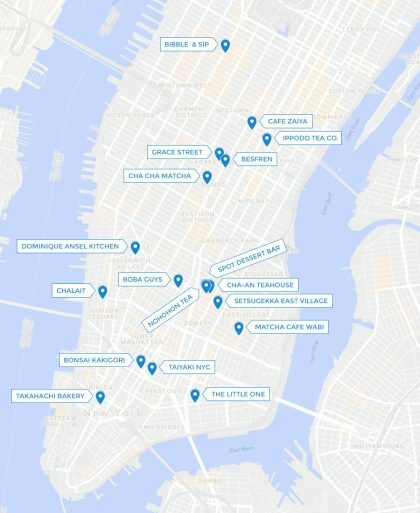 There’s about half the caffeine of coffee. This one has a nice bright green color without costing a ton. 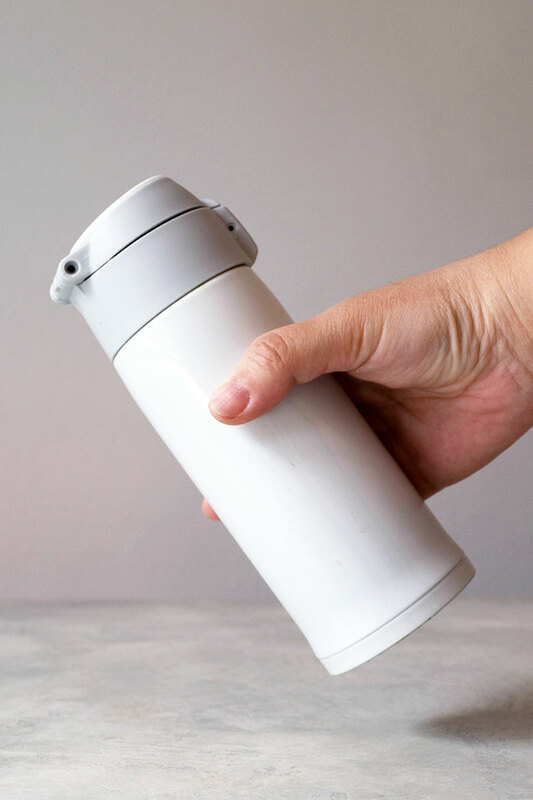 I’ve been using this to sweeten all my tea lattes. This brand is an absolute MUST in any kitchen. Makes everything taste 1000x better. Gah, these are so freaking cute! 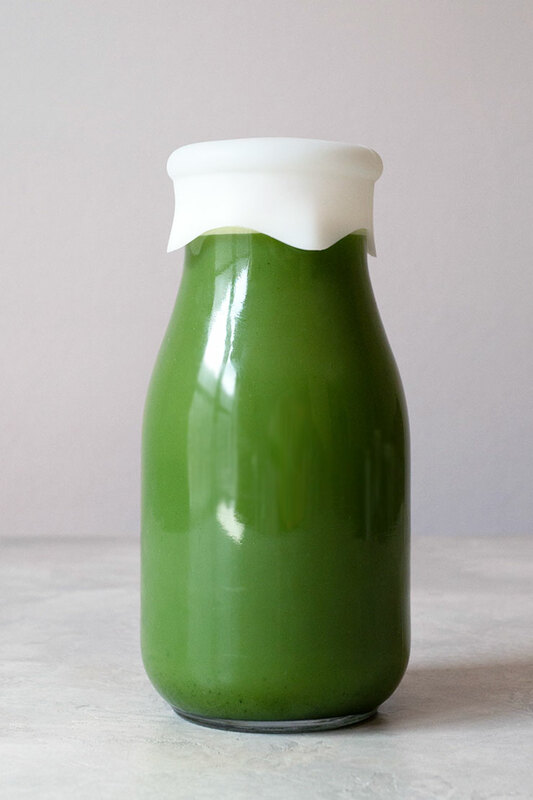 The key to making any cold matcha drink is to shake matcha and water like crazy in an airtight container. 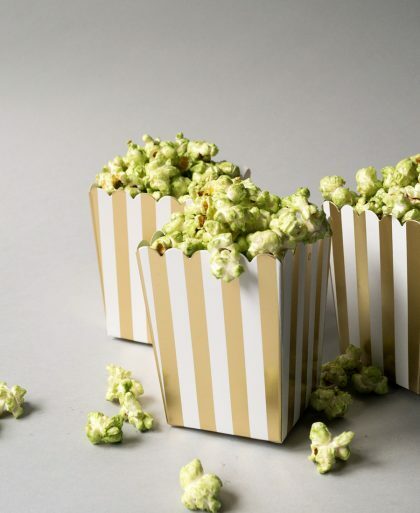 You don’t need bamboo whisks, matcha bowls, or any fancy equipment. You only need a bottle with tight lid. The easiest to use is a small water bottle with a wide opening, like mine pictured above. If you have a cocktail shaker, you can use that too. First, pour in the water. This is to make sure the matcha doesn’t clump up in the bottle. 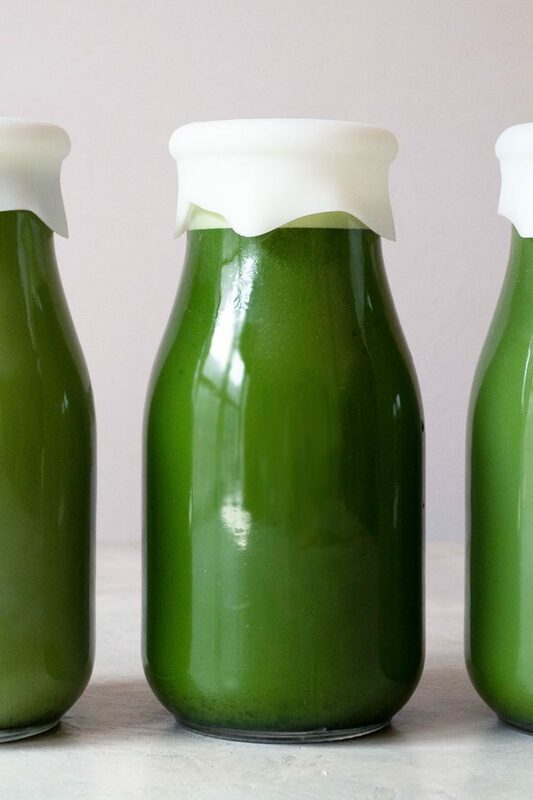 This matcha milk recipe uses 1 teaspoon of matcha green tea per serving. Close the lid and make sure you have a tight seal. I like to shake it vigorously at least 10 times. So it’s more like shake, shake, shake, shake, shake, shake, shake, shake, shake, shake. Open the bottle and add the maple syrup, vanilla extract, and salt. Next step is combining the milk and the matcha. I’m using these completely adorable milk bottles that have leakproof silicone lids to store my matcha milk. You can also drink straight from the bottle. 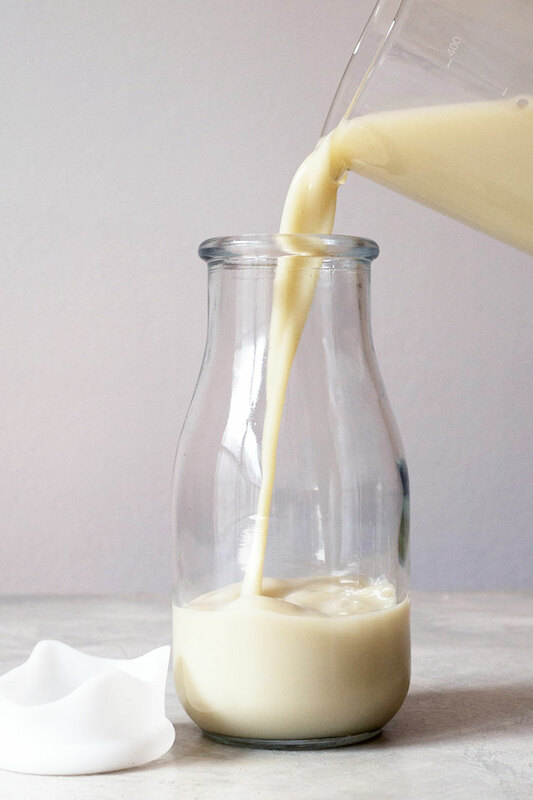 This drink is completely vegan since I’m making it with oat milk. I’ve been all about oat milk lately and love how it tastes with matcha. It has a lovely mouthfeel it’s rich and creamy. 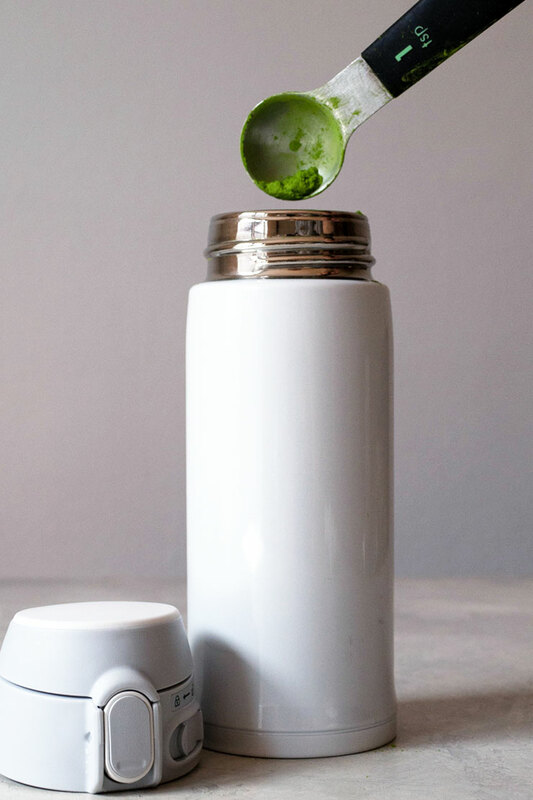 Pour in the sweetened matcha from the water bottle into the milk bottle. Because I’m using a good quality matcha the drink is a nice bright green. 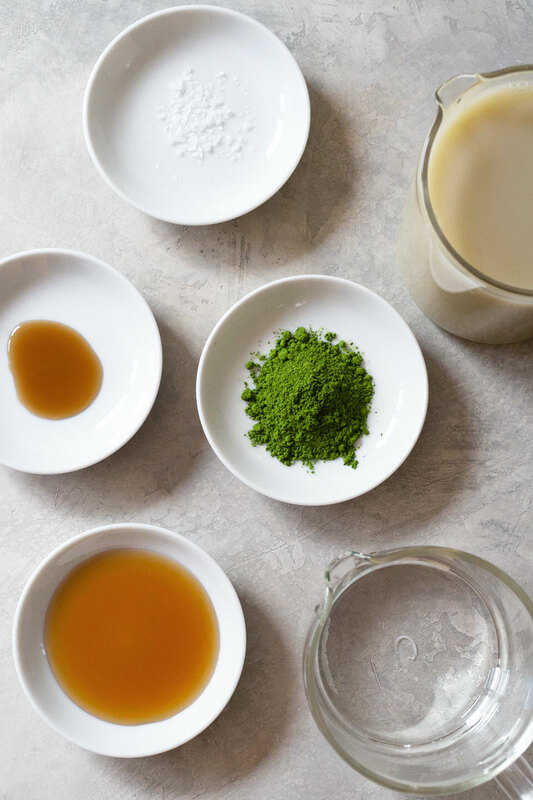 The lower the price of your matcha, the lower the quality and your matcha milk may be more brown than bright green. Each milk bottle is 16 oz. and it will hold 2 servings of the matcha milk recipe. 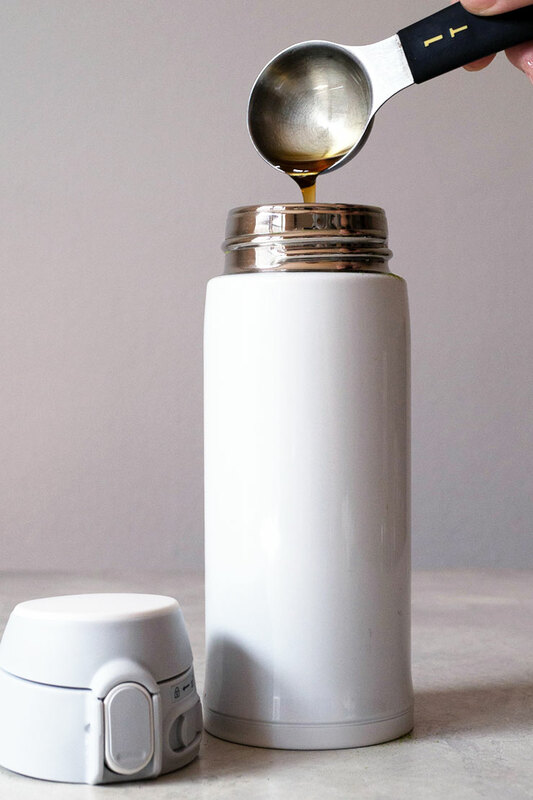 A wide-mouth bottle will make it easier to put the ingredients into the container. You don’t want to make a mess trying to get the expensive matcha powder into a tiny opening. Matcha is meant to be had with something sweet so adding a sweetener into the drink makes it taste so much better. The better the quality of matcha, the brighter the green it will be. The more expensive matcha is practically neon green. The cheaper matcha is a dull, brownish green. I used maple syrup but you can use honey or simple syrup. Regular sugar won’t dissolve and it will sink to the bottom. The drink can be served with or without ice. A robust and delicious matcha drink made with matcha and milk. 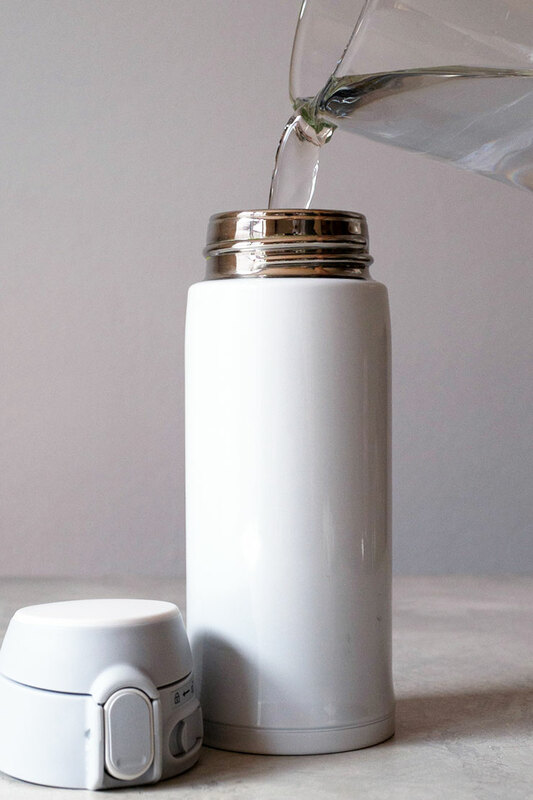 Combine water and matcha in an airtight container. Shake vigorously 10 times. Add maple syrup, vanilla extract, and salt. Shake 5 times. 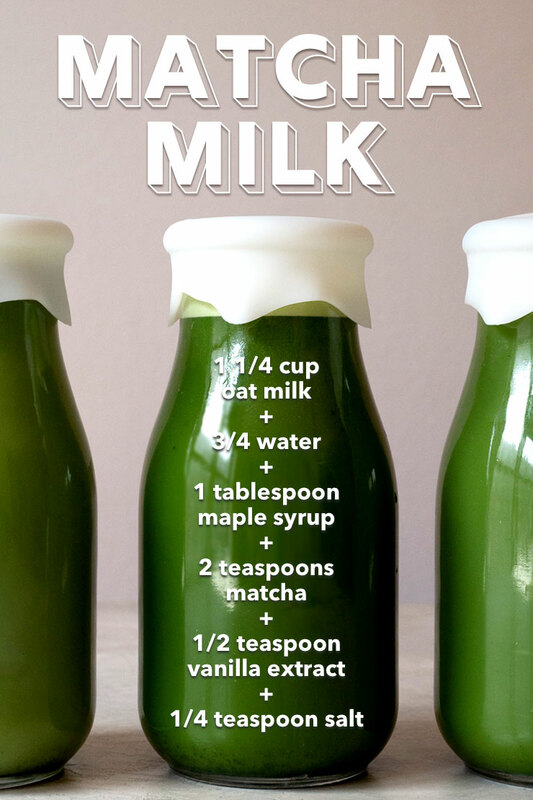 Pour oat milk into a bottle followed by the sweetened matcha. Serve with or without ice. Or drink straight from the bottle!